I was in the backwaters of Nevada (ok, to be honest, most of Nevada is in the backwaters), near the CA border east of the White Mountains. I was on my to Reno via a very circuitous route to meet my family for a volleyball tournament over the weekend. I needed to be there by evening and still had a lot of driving to do to get there. I still managed a P2K, a P1K and then a small handful of quick roadside summits. I'd have loved to have at least another week to make a better showing of it, but I suppose it just gives me a good excuse to make another future trip to the area. This P4K is the highpoint of the Silver Peak Range (you'd think Silver Peak would be the highest, no? ), separating Fish Lake, Big Smokey and Clayton Valleys. It's a gentle range without the dramatic relief of the White Mountains across Fish Lake Valley, whose peaks might be considered boring to some. Yet the high elevation rising to well over 9,000ft allows pinyon and juniper forests to thrive (and periodically burn) above the more searing desert landscape in the valleys below. I had driven to the TH described by Zdon after a long drive up McAfee Canyon from the west, reaching to 7,500ft where the fair dirt/gravel road goes over a saddle. I had some trouble locating the route he describes and had spent about half an hour the previous evening after the drive trying to locate the "road heading north". The detail missing is that the turnoff for this road is found a short distance east of the saddle, after the main road begins to descend. It was just before 6a when I started out under a predawn sky about 20min before sunrise. Snow could be seen on the White Mtns to the west still hiding in the early morning shadows. Piper's summit is visible from the start but not at all obvious due to its flattened profile against the sky looking north. I followed the road as it wandered north for almost a mile, eventually leading to a ridge where it turns to the left. Desiring a more direct route, I left the road to sidehill across slopes heading more northerly. A considerable amount of elevation was gained before the trees gave way to lower, wind-swept scrub that dominates the highest elevations of the range. This almost turned into a bushwhacking effort but thankfully never got too thick to become problematic. Clouds abutted the summit crest on the NE side, bringing cool air and fog over the ridgeline. They must have come over more heavily during the night because they left a dusting of ice crystals near the summit that still clung to the shadier spots in the early morning. After a little under an hour and a half I found my way to the summit. It was still pretty cold, probably under 40F. What a contrast to the earlier part of the week when it was 65F at sunrise. Aside from the 1950 benchmark, Gordon (sans Barbara this time) had left a register in 1986 that has proved popular with almost 50 pages of entries. There was an older scrap of paper with it, an envelope with a 1963 postmark from Sacramento, but much of it has deteriorated and been rendered unreadable. For the return route I simply straightened out what I'd done on the ascent, avoiding the upper section of road that jogs west in the wrong direction and reconnecting with the original route lower down at the 7,800-foot level. It wasn't yet 9a by the time I'd . This small range of hills is neatly tucked into a triangular boundary of pavement between between SR264, SR773 and US6. Getting to the summit is neither long nor difficult, even from the pavement. I parked just off SR773 SSE of the highpoint, less than 3mi distance. A better vehicle can cut the distance almost in half by following a rough dirt road to the base of the formation. As one starts off, there is a large, obvious canyon almost cleaving the Volcanic Hills in two. I steered left of this because I was following the road, but I think it makes for the more interesting route which I used to descend. Another medium-sized canyon lies about 1/4 mile to the left (west) but my ascent route went up a smaller, steeper gully between these two. It had some modest class 3 scrambling of some interest but was short-lived. I landed on a ridgeline marking the west side of the larger canyon and followed this up to the summit in about an hour and a quarter. The summit itself is quite broad and rounded, the last 15min or so an easy walk over lightly vegetated terrain. I traveled first to the benchmark (finding two) before making my way northeast to what appears to be the higher point. Several highpointers armed with hand levels seem to agree judging by their register entries. One of these was John Vitz who left the current one in 2010. Because the summit area is so large, views weren't so great. An interesting view was found to the south where some clouds were doing their best to produce some desert precipitation. Hopefully I'd be able to get off the summit and heading north before it moved my way. The descent down the main canyon on the return was the most interesting part of the day. The upper part was broad and tame, but this soon narrowed before traveling through a rock garden with some rather large boulders. I kind of suspected there would be dry waterfalls and was not disappointed in this, finding four or five that presented a challenge. The highest one could not be descended (by me) directly, but had a traverse on the west side to get around it. The next one with no bypass looked scary but turned out to be a fun class 3 descent on good rock. The third one encountered had a class 2 scree-filled chute to bypass it to the west. The lowest one had no bypass but also proved class 3. There may have been one or two smaller ones, but these were of no serious consequence. Emerging from the mouth of the canyon I continued south in the wash. I was presented with a view to the west of fresh snow on Boundary Peak at the north end of the White Mtns - seems there was more precipitation up there in the last 24hrs than I saw on the east side of Fish Lake Valley. I was back to the van by 12:30p and had to call a halt to serious peakbagging - I had several hundred road miles to get myself to Reno by evening. This of course didn't rule out non-serious peakbagging. As I drove north I kept my eye on my GPSr for signs of any named summits found along the highway. The first of these was found just east of US95 at the north end of the Columbus Salt Marsh (looked pretty much like flat desert to me). Rock Hill took all of 8min to shimmy up it sandy slopes from the northwest. Even faster coming down. The hill and surrounding terrain are all BLM lands. 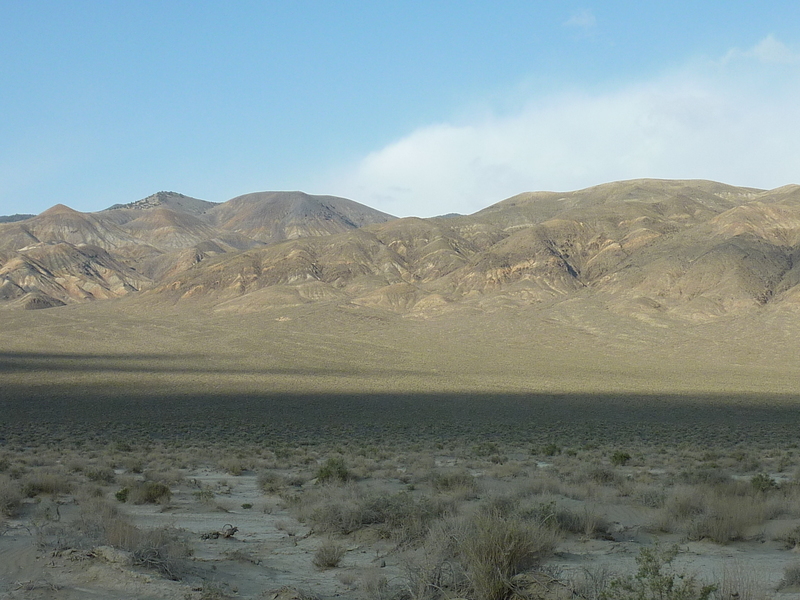 I should have guessed from the name, but I didn't realize at the time that this squat little hill is entirely located within the vast Walker River Indian Reservation, north of Hawthorne and Walker Lake. I managed to drive within 1/4mi of the summit on a dirt road before being stopped by a gate. After turning the van around, I parked and jogged my way to the top in 5min, or what I could make out was the top according to the GPSr. The summit area is large and flattish, not very high nor very interesting, either. Bob Sumner, often prone to exaggeration, described it as the worst summit in Mineral County. He may have been spot on this time. As I was leaving to return to US95 I passed a tribal police SUV that had just turned off the highway, no doubt to investigate my doings. I'm not sure that he would have bought the truth. At first I thought this tiny hill, located just north of Yerington on ALT US95, was the namesake of the illustrious Gordon but the spelling isn't quite right. The land east of the highway on which the hill lies is all private property, but I didn't find any obstacles in the way of fences, gates or No Trespassing signs. If I saw the latter I don't recall them, but I do remember the place littered the shells, beercans and other redneckish trash. The summit has a couple of small solar-powered antennae, purpose uncertain but possible for weather observations. It is a pleasant viewspot overlooking irrigated farms in Mason Valley along the Walker River. A few miles north of McLeod Hill is Mason Butte, a small outcrop on the left side of Mason Valley. The land appears to be all private property but there are no signs or fences to warn you away. Motorcycle tracks can be used to easily reach the summit from just about any direction. No antenna on this one. Views are similar to those of McLeod.